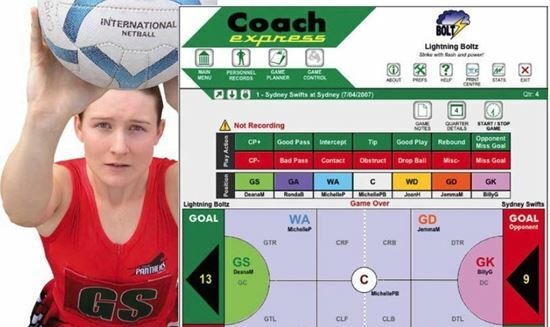 Powerful Coaching and Team Management Software for Netball Coaches. Download now and use freely in demo mode. Once purchased, your unlock clode is emailed to you and your file copy unlocks to full version automatically retaining all your data. Allows a netball coach to quickly manage personnel, season games, notes, reminders, player reviews and extensive statistical information. At the heart is the unique Game Control - a fully featured real-time game recording device. The Game Control can generate the statistics as they happen, thus allowing the coach instant access to vital statistics at any time during a game. After the game, the coach will have more time to focus on improving team performance because not only is the summarised statistical data automated, but so is its dissemination. Player game reviews and statistics can be emailed on the fly (automatically generated PDF files) or simply printed. Initial setup process will have your season organised in minutes. Straightforward navigation and logical functioning. No more manual paperwork after the game. Instantly view game statistics, even during a game. Recall statistics for any game and any player. Compare team performance by quarter or game. Coach Express automatically calculates shooting percentages for the home team, opponents and individual players. It can also automatically email players their individual game reviews and statistics according to any game they played. Manage personnel data, including their notes, reminders, game reviews and performance. View statistics by game time as well as quarter and see exactly where play actions improved. Check vital action stats such as positive and negative centre passes, where they went and to whom. Discover emerging patterns from the detailed Action List. Implement effective and productive coaching strategies even when your team fails to win. Coach Express will provide a wealth of information for a progressive coach seeking to enhance team performance. Your downloaded file is actually a full version ready to be unlocked after purchasing registration. Your data will be preserved. Please advise us if you have a preferred username when ordering. Download now and instantly start using it in demo mode.